Through great classical commentaries, you will come to treasure the majesty, beauty, and finer points of guidance found in the Book of Allah. 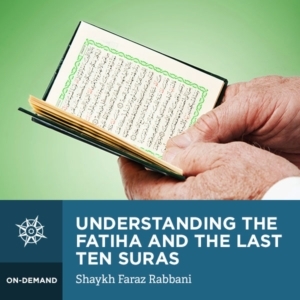 Shaykh Faraz Rabbani offers an in-depth explanation of Sura al-Fatiha and the last twelve Suras, from al-‘Asr to al-Nas. This course will deepen your faith and strengthen your connection with the Book of Allah and its guidance. It will also increase your appreciation of the value, and depth of our great scholarly tradition. Understanding the meanings of the Qur’an is the key to achieving deeper levels of reflection and appreciation of our Lord’s address. With more understanding one can achieve a greater connection to the Qur’an and reverence for it, finding serenity in remembrance of Allah through recitation of His book, ultimately drawing ever closer to Allah and becoming one of the people of the Qur’an in following the example of the Prophet, peace and blessings be upon him. Drawing on classical commentaries, Shaykh Faraz Rabbani illuminates and expands on the meanings of the verses we most often recite in our daily worship, allowing us to bring more life into our worship. He provides an in-depth explanation of the shorter, more commonly recited Suras of the Qur’an: Sura al Fatiha, the last twelve Suras of the Qur’an, as well as Ayat al- Kursi and the last few verses of Sura al-Baqarah. He also provides a detailed explanation of the Basmalah, and what we really mean when we seek refuge from the devil before reciting the Qur’an, as well as its virtues and how to rectify our intention when reciting it.